One of the great things about online fundraising is the ability to track your progress in real time. When your results are constantly updated, you don’t need to hope for the best and wait until the campaign is over. You can check in regularly and make adjustments as needed. In order to measure against your campaign goals, you can run reports in Classy whenever you need. Use these insights to inform your decisions and motivate your team and supporters. For example, if you see that 80 percent of your fundraisers have transacting campaigns, you might announce that statistic to all of your fundraisers and encourage everyone to push for a donation by a certain time. This sharing of data helps create a sense of urgency, social proof, and a clear line of sight. Despite the power of these mid-campaign insights, many organizations review reports in Classy after their campaign has already ended. 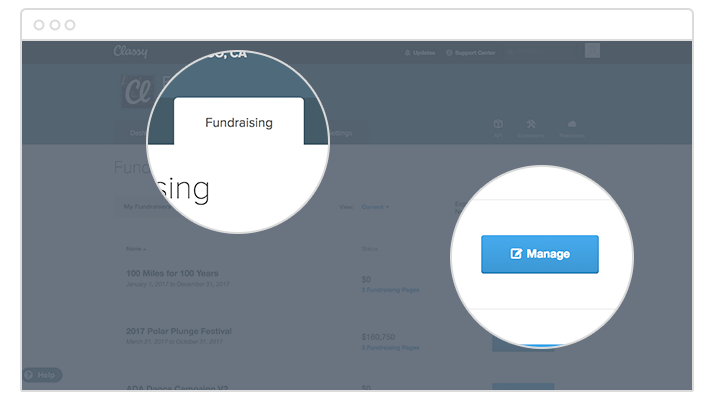 Becoming comfortable with pulling and interpreting fundraising data is essential to running effective campaigns that grow year over year. 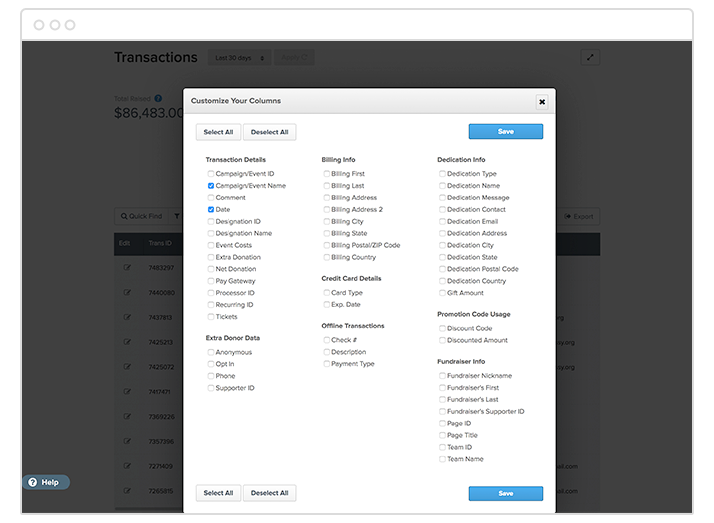 To help you understand reporting features within Classy, we walk through the two main types of reports and where you can find them. 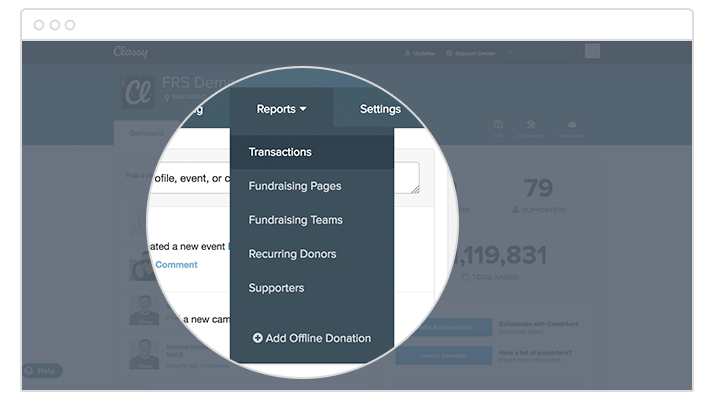 Global reporting allows you to get a bird’s eye view of your fundraising results. This dashboard will show your results across your entire organization, so that you can look at data from multiple campaigns at once. This type of reporting is essential as you look at your organization’s year-over-year growth and consider your progress or goal-setting. Export to Excel to further manipulate and dig even deeper. For example, you might use a global report to inform an email series. Say you’d like to message everyone who has ever raised over $5K for your organization. With an exported global report, you can identify your all-time cause champions for that message. “Segmentation is a fundamental piece of every campaign effort. Organizations who successfully activate their supporters know their audiences well and speak to them accordingly. Whether you’re just getting started with your segmentation efforts or you’ve got it down to a science, there are insights to unlock in global reporting. 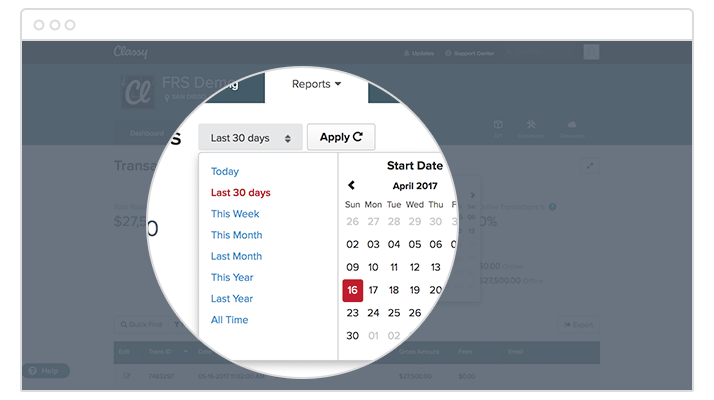 Within each report, you can then select the time period you’d like to look at. “If you’re running an annual campaign, one best practice is to soft launch by re-engaging those who participated in years prior. Their early support can jumpstart this year’s campaign effort and in turn motivate others to get onboard. Global reporting allows you to identify previous years’ champions and create a communication plan to re-engage them. You can also go a step further and create personas around these groups of individuals in order to invent strategies to recruit more supporters like them. 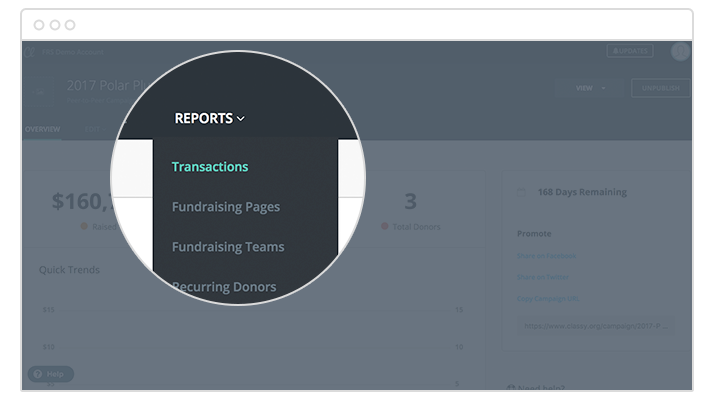 In addition to checking on your results as an organization, you can also zoom in and manage reports at the campaign level. 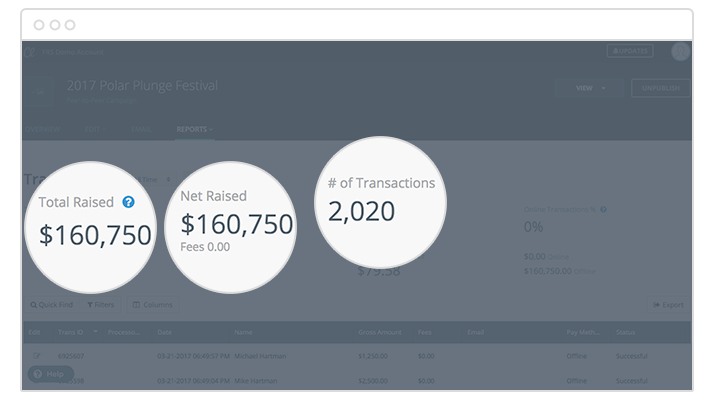 Whether it’s a peer-to-peer or crowdfunding campaign, or you’d like to monitor your event’s registration and earnings, campaign level reporting gives you the insight you need to manage your fundraising efforts proactively. When you collect more granular campaign data, you can determine if you’re on track and hitting key campaign milestones in terms of number of donors, amount raised, or number of fundraisers. One of the keys to success is constant vigilance. 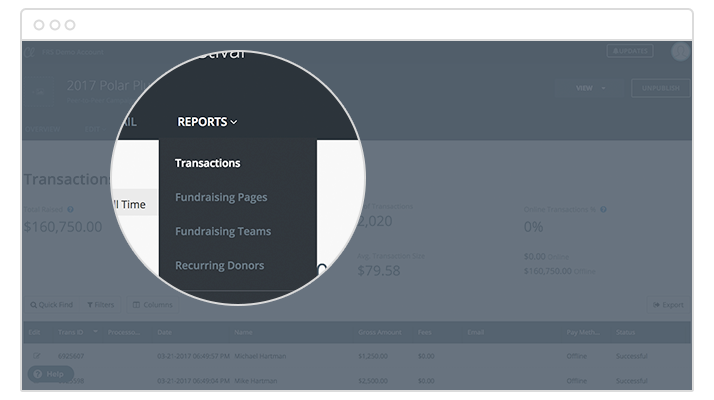 Run reports in Classy often to make informed decisions that help you raise more dollars for your cause. Share your own nonprofit reporting tips in the comments below.